Facebook’s new commenting system is only about a week old, and already I see the growth and integration expanding for login options. 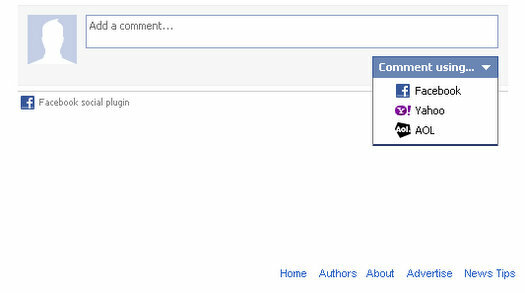 When Facebook first announced the new comments plugin, the only login options I saw were for Facebook and Yahoo. I found it quite impressive that Yahoo was even added as a login option for the new Facebook commenting system since up to now, everything about Facebook has been… well… exclusively Facebook. But today I’m seeing a new addition to the login options for the Facebook comments plugin, and that being AOL. Rumors are that Facebook tried to strike partnerships with both Google and Twitter as login options, but at the last minute, both decided to pull out of the deal. It’s becoming more and more clear that Facebook, at a higher level in their business model, simply wants to own the entire web. With rapid production of the array of Facebook plugins that can easily be integrated into any website, Facebook simply wants to socialize the web, with their servers and social graph being the engine that drives it. I like the concept actually, and I’m thinking that Google and Twitter might be a bit too self-centered to not see the opportunity here.